This figure first appeared on The Empire Strikes Back 31 back card. Comments: If you have ever wondered ?what?s in a name? 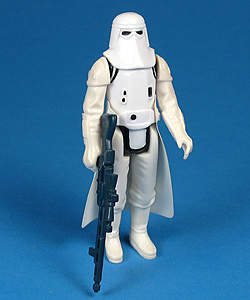 you need look no further than the vintage Imperial Stormtrooper (Hoth Battle Gear) action figure. Even though what seems to be the whole collecting world knows him as "Snowtrooper", the figure was never actually referenced as such on any version of its packaging ever. Granted, with the latest Hasbro version sporting the moniker, and Hasbro buying (and subsequently demolishing) Kenner, you could say that they finally got it right, but to the vintage collector ?Snowtrooper? will never be more than an affectionate nickname for a dude with a ten syllable name. Major Variations: Though all vintage figures have minor variations, The Imperial Stormtrooper (Hoth Battle Gear), affectionately referred to by most vintage collectors as the Snowtrooper, has no significant mould variations. 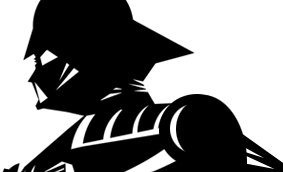 However, the Tri-Logo version does have a slight variation in the figure?s cape. Instead of the slits that can be seen on the common version?s cape, the Tri-logo cape had a small circle punched out on either side to hook onto the figure?s waist. For years now, the Tri-Logo version of the Snowtrooper has been incorrectly referred to as the YPS Snowtrooper, because YPS ?a German kids magazine- packed the figure in with one of its issues. Since the figure had first appeared, and continued to appear on the Tri-logo card, it should properly be referred to as the Tri-logo Snowtrooper. Interestingly enough, some of the YPS pack in Snowtroopers included a weapon that wasn?t even from the star Wars toy line. Rumoured is a grey moulded limbs version of this figure, but research indicates that they are nothing more than a hoax brought on by a dealer who either produced the fakes himself, or purchased a large amount of them from someone else. To date, all that have been documented have been proven to be fake.